CHAMELEON PEOPLE is Hans Olav Lahlum’s fourth full length crime novel set Norway’s recent past to feature a young police detective and his civilian sidekick. I’ve liked all the novels very much but this is my favourite. So far. One of the reasons I liked it so much is that it’s written by a historian. Undervalued people historians. Among other things they remind us that history repeats and we, mostly, survive. Even the darkest of days. This sentiment bears repetition just now. Although set in Norway in 1972 the book has a very present-day feel because its backdrop is the Norwegian referendum on whether or not to join the EEC (the predecessor of the EU). The politics is heated, families are being torn apart and it’s at least possible that the impending vote is responsible for a murder. There is also a thread in which Soviet agents are potentially engaging in unauthorised activities within Norway’s political and business scene. This eerie familiarity is darned impressive because the book was first published in 2013 (so presumably written at least a year or so earlier); long before Brexit and the TPP and Russian hacking scandals had become part of our brave new world. The specifics of this story involve the murder of Per Johan Fredriksen, a wealthy businessman and politician. He is stabbed on a crowded street and the police are soon in pursuit of their suspect: a young boy on a bicycle. For a reason that won’t become clear until it’s too late the boy surrenders himself to the series hero Inspector Kolbjørn Kristiansen, known to everyone as K2. While most people think this wraps the case up neatly and quickly K2 is inclined to believe the boy’s claim of innocence. Though he wishes the boy would help himself more and not leave K2 in the dark about what really happened. In an effort to truly investigate the case K2 introduces himself to Per Johan Fredriksen’s surviving family members – his wife, three children and current mistress – and business associates. He learns there’s more than one motive for murder amongst this lot. He also finds out it is possible that Per Johan Fredriksen’s death is related to the decades old unexplained death of his wife’s sister. Or is it his politics? Or his potentially illicit communications with Russian spies? 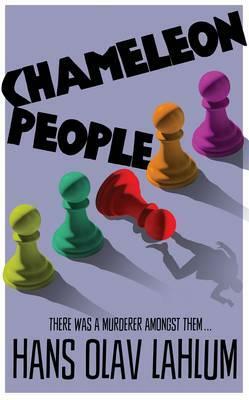 CHAMELEON PEOPLE probably contains the most complex plotting of all Lahlum’s novels to date but I absolutely loved all the twists and turns and found everything gelled. That doesn’t mean there aren’t some loose ends, and a few tears, but everything is logical. Another thing to savour about this book is its character development. The lives of series regulars – K2, his civilian helper Patricia and his new fiancée Miriam – all take a bit of a battering here, although there are some good times as well for a bit of balance. K2 struggles to fit both women into the professional side of his life. He doesn’t want to spark jealousy from either lady but at the same time wants them both to be sounding boards. I thought this conflict was handled very realistically. Indeed K2’s personal relationships in general are handled very well here. Perhaps because there are not happy endings all ’round. I learned after reading the book that there are some novellas available only in Norwegian that are set in the period between the end of the last full length book and the beginning of this one and I do feel like there are a couple of things I’ve missed out on due to my woeful language skills (when and why did Patricia start willingly leaving the house for example?) but I’m still really enjoying seeing these characters develop across the series. With four books under its belt and me liking each one a little more than the last I think it’s fair to say this series is now a firm favourite. It ticks all the right boxes for me: engaging characters, interesting exploration of social and historical themes and terrific plots which combine the best elements of golden age detective stories with some modern sensibilities. I also enjoy that each one so far has explored some aspect of human nature with the type of murder victim or suspect at the heart of the novel (as reflected by the title). Here it is people who are chameleons; who can display a different face or personality depending on their audience. Our first murder victim is a harsh businessman to some but a loving and generous confidant to his mistress for example. And some of the suspects have even more chameleon-like layers to their personalities. I can’t be the only one who ponders this aspect of the books by contemplating my own family, friends and colleagues in a new, not always flattering, light. Right? This entry was posted in Hans Olav Lahlum. Bookmark the permalink. Really pleased you enjoyed this one. Hoping the next in the series is translated soon. You have gotten me interested in this series. I have run into his books at the book sale, maybe not too many books by Scandinavian authors show up there, I am not sure why that would be. I especially like the setting in the 1970’s. OK. It’s going on that ridiculously long TBR list. But it sounds like a good one. I haven’t had much reading time, have been in the middle of two books for a week, just too darn much going on in the news. Saw a good movie, too, Denial, with Rachel Weisz and Tom Wilkinson, about a Jewish professor, a Holocaust expert, who is sued in Britain by a Holocaust denier. Well-done. I know what you mean about not reading much Kathy – this is the only book I’ve finished so far this month.